This shooter classic has been ported to a number of systems, but the Jaguar cart is the only one I’ve played (other than the arcade original of course). And while there might be a better version out there (most likely psx) this doesn’t change the fact that the Jag version is great! Surely brilliant on any hardware, here is my review of Raiden. 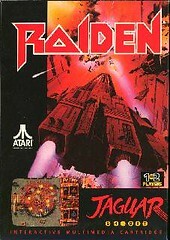 With Atari execs deciding to scream about the Jags 64-bit power (not the smartest move) Raiden might seem like a curious choice as a launch window release. Being a port of a game released over 3 years earlier, the graphics had already started to date. But apparently (correct me if I am wrong) this was one of a small few games that had been planned for the Panther, the machine that was ultimately scrapped in favor of the Jag. So it makes sense that they’d want to use it. And despite its aging appearance that in no way hinted of 64-bit power Raiden on the Jag still manages to look good, just like the arcade original. 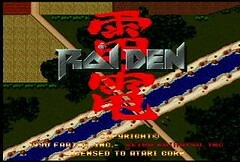 An attractive game with very clean and colorful visuals, Raiden really benefits by throwing variety at the player. I for one certainly appreciate how the missions take place in a number of locales, not just in the dark star filled skies. The first 5 levels take place planet side before moving you into space for the final 3 nerve racking ones. It’s a fun game to watch to as you’ll pick up details you might have missed prior. Raiden also throws lots on the screen at once with no slowdown. But I’m getting ahead of myself … what is the plot of Raiden? Heh heh … it’s a shoot em up, do any gamers expect an actual story? For what its worth, you are driving off aliens … big surprise eh? Story matters not a bit in Raiden, or any shump for that matter. Said aliens inch up from the bottom, swoop in from the sides, and dive bomb you like kamikazes. It is intense, but there are good core weapons available to drive them off (which do you prefer, red machine gun or blue laser?) as well as bombs and homing missiles. The music for Raiden is truly great in my honest opinion, and very memorable. The Jag does it proud, and it sounds top notch especially for a cart. (having heard cd tunes of the psx version I actually prefer the Jag music, surprisingly) You may even appreciate it more on the Jag as it is not drowned out by the constant hammering of the arcade buttons. Although the explosions may not be as powerful as you like, the sound effects seem appropriately subdued as to not grate on your nerves or drown out the great music. While the Jag pad is not my ideal controller, it doesn’t matter much in this game. It controls well, although your thumb may hurt if you play several games in a row. I find I really prefer the pro pad just because the d-pad seems to have more give to it. I don’t consider any of these flaws … for that matter, I think the game has no real flaws of note (a better ending sequence perhaps) It is good as is. And (for being a straight port) the Jag version is good as is. I highly recommend picking this game up. It has a lot of positives. The replay value is sky high too. Add in the crazy fun 2-player mode and you have one of the best shooters ever made! Last edited by Trev on Sat Nov 03, 2012 3:05 pm, edited 2 times in total. Here are some other details that readers (or purists) may find interesting: The screen and objects don't move as smoothly as other versions of Raiden (Primarily the arcade, PSX, and Genesis releases). It looks like the overall framerate is a bit lower. Some people may not notice it, but it's a little awkward to come to after playing, say, the Playstation port. In the arcade game you could fire as fast as you could mash the button, while in the Jag version there is a limit to how fast you can fire. This can especially be a drag when you've lost a ship and have to start back from square one with the red shot, halfway through the game. Another difference between this one and the arcade version is the speed of the game. All bullets move quite slow initially. Only after completing the game once or twice do the bullets speed up (The third time around the bullet speeds are much more true to the arcade game). It would have been nice if they added in difficulty settings so you could start off with faster bullet speeds. Some other notes, this game features arcade tunes as well as new tunes made specifically for this version (and the PC game). Tunes that appear on certain stages were also alternated. Regarding the side bar, a lot of people complain about it. I personally dig it.. It looks cool, for one, and it allows the game to keep its original vertically-oriented aspect ratio, like you mentioned, allowing the screen to scroll heavily to the left and right. The PC version (based loosely on this game, also made by Imagitec Design) actually does not use the side bar, and it actually feels like something's lost when playing this game at full-screen. Anyways, I just thought I'd throw those differences or details out there for those interested. 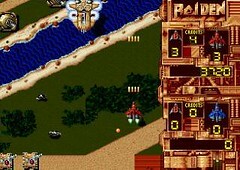 All in all this is still a great port, and I personally highly recommend it for fans of shoot 'em ups. It's not too expensive, either (It can be bought complete for about $15 USD). Cool, thanks for the info Austin.